Boston Dynamics is an American engineering and robotics design company founded in 1992 and headquartered in Waltham, Massachusetts, and is a wholly owned subsidiary of the Japanese conglomerate SoftBank Group. Every few months, Boston Dynamics uncovers another video outlining yet another amazing capacity from its rapidly advancing line of robots. The most recent couple of clips are no exemption, this time demonstrating its Atlas robot taking an easygoing run in the forested areas, while SpotMini is indicated self-governingly taking a long exploratory mission around an office building. 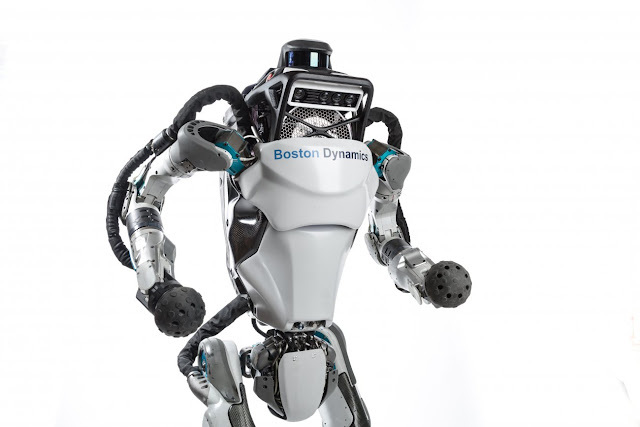 The clips released Thursday detail the advance that Atlas, a humanoid robot, and SpotMini, a doglike robot, have made. SpotMini, for instance, is utilizing cameras to recognize and move past deterrents, for example, office furniture. In this video you can see that the Atlas robot runs through a traverse tricky terrain and even senses when it is advancing towards an object At one point, the robot recognize that it is coming upon a log on the ground.It slows to a stop, jumps over the log and keeps moving forward. The Atlas robot video wasn't the main clip Boston Dynamics released yesterday. It likewise distributed this recording of SpotMini—an autonomous robot that we saw opening handles not long ago—self-governingly exploring its way through an office and lab. Total walk time for this route is just over 6 minutes. Boston Dynamics reports that before the test robot was manually driven through the space so that it can build a map of the space using visual data from cameras mounted on the front, sides and back of the robot.During the autonomous run, SpotMini uses data from the cameras to localize itself in the map and to detect and avoid obstacles. Once the operator presses 'GO' at the beginning of the video, the robot is on its own.